Happy Friday everyone - Jummah Mubarak! It's been a slow week around here so no big reveal to share just yet, but the basement bathroom is almost finished! 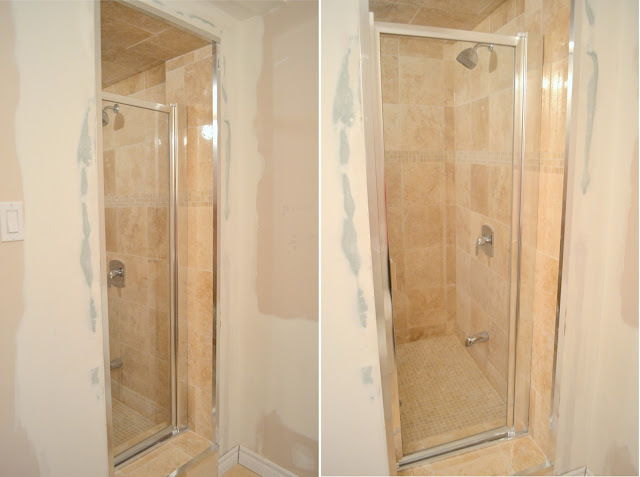 The shower is complete and the drywall is patched, all it needs is a fresh coat of paint and a little caulk around the trim. Then God-willing we'll be moving on to the kitchenette! New potlights are going in today in the master closet - exciting stuff! So glad we had this done, it was uber dark in there before. Would have loved a pretty chandelier of course, but the potlights made more sense in a closet this size. Plus my parents had these fixtures leftover from their basement reno, so they were free! I had it in a spot with tons of light but it just hasn't adjusted well to the new house. I tried repotting it, talking to it, even reading Quran over it. I'm still hoping and praying it'll come back to life in the spring - any suggestions? Love the shower! Is it marble? And I see red/coral paint? Hmmm, looking good Samaa dear. Poor tree, don't worry your not alone in this department, I too have "killed" a lot of good trees :-( good thing, spring is coming and we can start anew! HAHAHAHA, I totally laughed out loud at the "I even tried reading Qur'an over it" comment. Hi Samaa! I know your probably busy, but I just need to let you know that I already posted my fave bloggers' bedside table series! Thank you again for participating and for all the support! you rock! I feel your pain on the fiddle fig. I have 3 (!!) at home. One of them was a huge 6 foot 3 stemmed tree and after catching my kitty peeing in it-and rinsing the soil out in the tub, 2 of the stems died. The final stem is thriving. The other 2...one leafed and 4 leafed and losing quickly. In my experience, these should be called fickle fiddle figs! They are not easy to care for despite seeing it repeated all over the deco-blogs. They like bright direct light but filtered bright light. Your leaves look on the yellowish side so I dont know if the moisture level in the soil is appropriate and it was getting the proper nutrients. In my climate (Los Angeles) they like their soil moist but not to wet. I water my 6 footer about once every 7 days. I feel the top leaf to see if its drooping and soft feeling. If it is it gets a thorough watering and then I leave it be until the drying out cycle begins again. I also stuck into the soil fertilizer spikes because if the nutrient level is off it wont grow. I also occasionally give it liquid food when I give my other plants food. Ive also had to move mine around a bit to figure out where it likes to sit. If all the leaves fall off though, don't fret. As long as the stem is healthy it might sprout again if you keep feeding and watering it. Indoor Fiddle figs tend to have a slow grow rate and reserve a lot of energy to sprout out leaves. You may see an explosion of leaves...or just one. lol. good luck! PS. Love your blog! Stumbled on it way back when looking for the etagere hack which you did a marvelous job on. Wow, thank you SO much for all the great tips! And for stopping by :) Fickle fiddle figs sounds about right :) I think mine didn't adjust well to moving, and on top of that we have baseboard heating so it was probably too dry. I think you're right about my watering schedule - I never had it quite figured out. But just today I spotted a new leaf! I'm SUPER excited at the possibility that it's coming back to life - I'll definitely try out the fertilizer spikes, I was just adding a few drops of the liquid to the water before. Thanks again! DIY Penny Projects + A Winner!